We have always heard and read great things about Bob Books, the #1 Learn-to-Read Program, but believed we'd have to wait awhile to try them with our own young children. However, Bob Books has recently introduced a new category of books called My First Bob Books. We received a set of these educational and adorable books to use with Emahry and Jonathan. 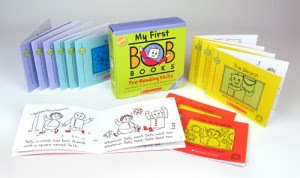 There are two different sets making up the My First Bob Books, including Pre-Reading Skills and the Alphabet. The Parent Guide offers additional activities, games and tips designed to support new concepts and build a foundation for reading. The Pre-Reading Skills Set includes 12 books that are 12 pages each. The Parent Guide offers additional teaching tips and activities to support kids’ growth and build confidence. The set includes 12 books that are 12 pages each. As with all Bob Books, these books are small, lightweight, and easy to read. Your kids will enjoy Bob Books and learn while they read! You can purchase your own Bob Book Sets from our Amazon Store. Each boxed set is less than $12 making them a very frugal way to teach your children to read. Have you used any of the Bob Books to teach your children? Please, let us know what your experience has been. We received a My First Bob Books Set from Scholastic to review so we could write this post. All opinions expressed in this post are 100% ours. A little over a month ago, we were given a $50 gift card and asked to review Chili's Bar and Grill Restaurant and write about our experience. We were super excited about the opportunity to take the entire family out for dinner. A night of no prep work, cooking, or dish washing sounded wonderful! 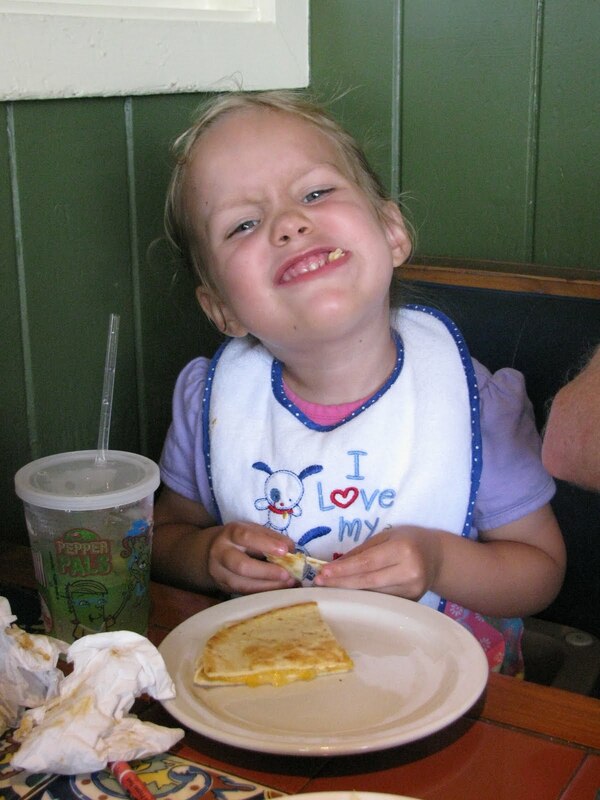 Chili's is a great, family-friendly restaurant that caters to everyone, as well as every budget. 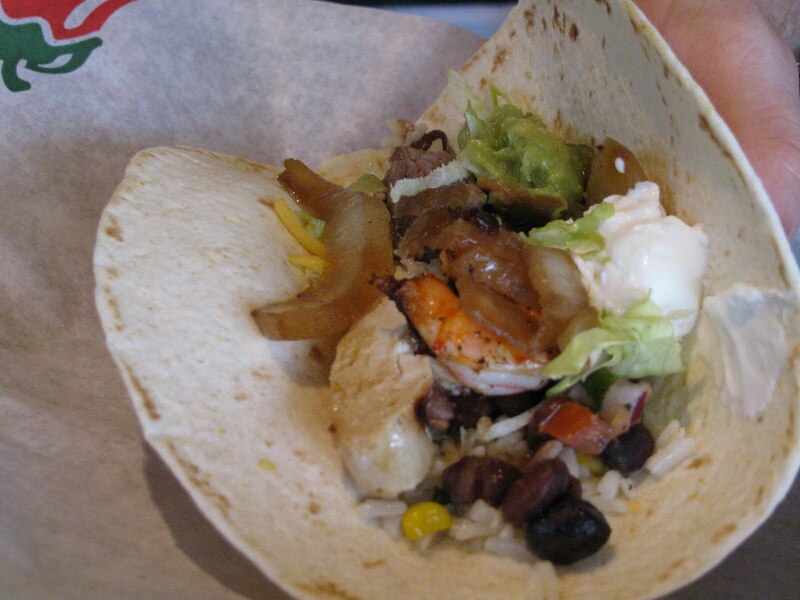 We discovered that Chili's has great prices, generous portions, and fresh tasting flavors. The items on the new menu all sound completely scrumptious. Chili's has a wonderful variety of appetizers, entrees, and desserts. There are meals that include chicken, seafood, beef, and pork. Chili's even has a Vegetarian Menu. They also have a wide array of sides that sound wonderful. Tim had discovered a coupon for a FREE Skillet Queso appetizer before we headed out to dinner so we started dinner off with the creamy, beany cheese sauce and incredibly thin and crispy tortilla chips. Jonathan especially loved the queso dip and would have scarfed the whole bowl down in 3 minutes if we hadn't moved it to the other end of the table! After gorging on our fair share of chips and queso dip, Tim and I decided to split a meal. 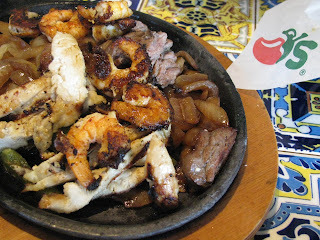 We ordered the Fajita Trio, grilled steak, chicken and spicy garlic and lime shrimp. Along with freshly lettuce, cheese, sour cream, guacamole, rice, beans and an extra order of tortillas this one meal was actually more than tho two of us could finish! Emahry and Jonathan shared a Cheese Quesadilla kid's meal. Even with sharing a meal we were all completely stuffed on our way out the door. Even better is that we enjoyed a wonderful meal out while only spending $26 including a 20% tip! Now, Tim and I will be able to use the second half of the gift card for a date night once my sister, our resident babysitter, returns to school. I've already scouted out the menu for what I'll order next time. Tim and I will probably share a large appetizer or meal and then get separate desserts. Not that I don't like sharing my dessert with my husband, but Tim can't eat chocolate and I absolutely LOVE IT. So, the thought of ordering a non-chocolate dessert leaves me with a little sinking feeling. Maybe we'll settle with the White Chocolate Molten Cake, since white chocolate doesn't bother Tim, but is still considered chocolate in my book. Then again, it looks so good that we may each want our own! We would definitely recommend Chili's for anyone who is looking for a relaxing atmosphere and fresh, delicious food. Chili's is also easy on the wallet so it makes an ideal dining out location for frugal families or those with lots of bellies to fill. Chili's has offered a $50 gift card to one of our readers! Also, don't forget to sign up for a FREE Chili's Chips and Queso Appetizer! 1. 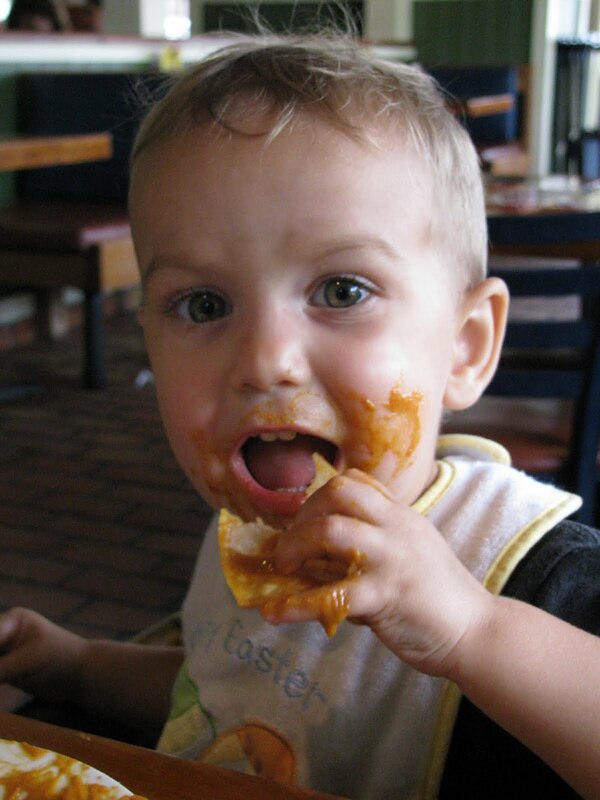 Head over to Chili's and check out their fantastic menu options. Then come back here and leave a comment telling us something you'd love to try. 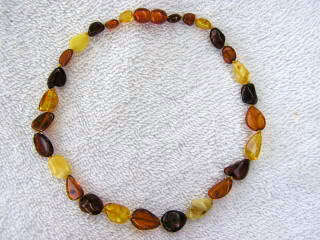 The giveaway will end Monday, September 6th at 11:59pm EST. We will pick the winner through random.org. I can't believe it actually happened...TWICE! #182. Two times in the past week I've been able to rehang my shirt in the closet at the end of the day with no signs of spills, stains, slobber, or spit-up! What can I say? I'm easily excited about clean clothes these days. Just show me a clean shirt that can be reworn and I go all giddy. What "small" thing are you excited about today? I'd love to share your joy and I promise to be just a little giddy for you. Interested in what else I'm counting as blessings? I do not intend to become a "deal blog" but there are just so many great deals going on right now that I want to share with you all. 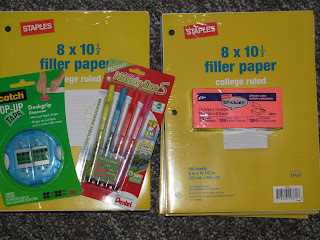 Yesterday on the way to a short family hike we stopped by Staples and picked up these great deals. 1 pop-up tape dispenser (regularly $3.00, FREE after rebate) This will be great to use while wrapping Christmas gifts! Our total after rebate = $0.91 including tax! Yesterday I took the kids on a long walk. After about 45 minutes pushing a double stroller while carrying Elyia in the Kozy I was very tired. When I unwrapped Eliya, Emahry asked me why the front of my shirt was wet. I told her it was sweat and slobber from Eliya. Despite being a little gross, I didn't bother to change my shirt since I knew we'd be outside later and I would just end up getting even dirtier. So, last night as I was getting Emahry ready for bed this was the conversation we had. Emahry: Mama, is your shirt still wet? Me: No, but it's a little stinky. Emahry: (sniff) Mmm...fmells like play-dough. Today is Thursday which means LAUNDRY DAY. Three loads planned for today, plus possibly washing sheets if we get to it. We have a full day! Tim's off all afternoon and evening, so the kids and I will try to get everything done this morning. We're also going to squeeze in a long walk to get us out of the house before the heat gets too bad, as soon as we get a load moved over to the dryer and get everyone pottied (or is it pottyed or is it just not a real word?) and dressed. Also, I need to make a shopping list during nap time today so we'll be ready for running errands tomorrow. I've just started on the adventure of couponing and drug store shopping, so the planning is a little more necessary. Any tips for a coupon and drug store newbie? Thanks to everyone who entered and be sure to check out all of the great jewelry at Inspired by Finn. Here's how you can get the same deal with NO COUPONS! Buy 3 packs in 3 separate transactions. Just make sure there isn't a line and the cashier should be fine with that. Pay for these packs Out of Pocket. Buy 1 marker pack and add 2 other small items to your transaction (need to have at least 3 items total). 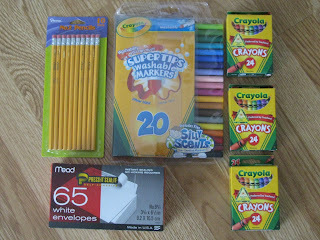 We needed envelopes so I grabbed a pack that were on sale for $0.49 and a pack of pencils that were on sale for $0.09. You could also grab 2 of those individual candies they have near the register. Pay for this transaction with the $3 in RR that printed with your receipts from the 3 crayon transactions. Pay the remainder out of pocket. Make sure the Mail in Rebate prints with this purchase. Take it home, fill it out, make a copy of your receipt and mail the rebate form and your receipt to the address listed. You should receive your rebate within 8-10 weeks, making your entire purchases today total around ONE DOLLAR. Of course if you don't need 3 packs of crayons (this should last us until the next back to school sales) you could still get a great deal by buying 1 pack of crayons and using that $1RR towards the markers. You would still get $3 back in the mail from your purchase making your entire purchase cost the amount of tax you had to pay out of pocket. Awesome!